This project deal with the study of solid waste of AL-Najaf city which belongs to AL-Najaf Governorate, one of the important Iraqi cities which has religious interest, This study include the identification of solid waste characteristics (generation rates, physical components, moisture content , density) . The examinations have been done on the waste for eight months as a rate, for the period from December 2003 A.D. until July 2004 A.D., to take into account the changes of seasons of the year and temperature on these characteristics. The rate of collection results were of 0.420 kg/person/day for generation rate and density of waste 473 kg/m3, as to moisture content were 48%. In addition to that, a comprehensive planning system has been achieved to management the solid waste of the city including all the activities from the point of generation to final disposal in a manner that minimizes environmental impacts. This research includes, two types of solid waste collection systems will be used, the vehicles and labor requirements for each system have been calculated. This study also includes the estimate of land fill volume required for disposal of Al-Najaf city with two adjacent cities (Kufa and Al-Manatherah), from year 2004 to year 2017, and future land requirement for one combined sanitary land filling (1000x1400) m. تناول هذا البحث دراسة النفايات الصلبة لمدينة النجف التابعة إلى محافظة النجف، وهي إحدى مدن العراق المهمة ذات الأهمية الدينية . وتضمنت هذه الدراسة التعرف على خصائص النفايات الصلبة (معدلات التولد ، المكونات الفيزيائية، محتور الرطوبة، الكثافة). وتم إجراء ألفحوصات على النفايات لمدة ثمانية اشهر وللفترة من كانون الأول 2003 م وحتى تموز 2004 للأخذ بنظر الاعتبار تغيرات فصول السنة وتأثير درجات الحرارة على هذه الخصائص . وكان معدل النتائح المستحصلة هي لمعدلات التولد 0.42 كغمشخصيوم، وأن معدل كثافة النفايات 437 كغم3، وأما معدل محتوى الرطوبة فكان 48 % . وبالاعتماد على النتائج الحالية والمسقطة المستحصلة عن كمية ونوعية النفايات المتولدة في المدينة فقد تم تصميم نظام لإدارة النفايات الصلبة للمدينة واحتساب المتطلبات الخاصة بجمع النفايات ونقلها ومن ثم التخلص منها دون تأثيرات بيئية، حيث تضمنت الدراسة المستقبلية إتباع أسلوبين في عملية جمع النفايات وذلك بما يتناسب وظروف المدينة، ولقد تم احتساب عدد السيارات والأيدي العاملة اللازمة لإنجاز العمل في كل نظام . وقد تضمنت هذه الدراسة احتساب حجم موقع الطمر اللازم (8633612) م3 ومن ثم معرفة المساحة الكافية وبأبعاد (1000×1400) م وإمكانية احتوائه بصورة مشتركة لنفايات مدينة النجف و المدن المجاورة (ألكوفة وا لمناذرة) لفترة (13) سنة قادمة. Concepts of both "Change ", "Architecture" are explored in relation to each other on the one hand and their relation with "Man" through "the product of architecture", aiming to clarify the influence of the recipient cognition in the process of change in architectural products, and also to clarify the act of continuous change taking place in the building and its effects on both form and meaning through time. The assumption here is that change takes place in architecture when the understanding of the designed and function has been changed to a new use. This change happens when the potentials of the building (under change) has come to a state in which it is ready to accept the new situation, so it resembles the (state of physical presence) while the new objective resembles the state of absence or absent potential, depending on the cognition of the recipient to be brought to actuality to in a combination, which is one among other possibilities in function and form shown in space I place though time. Research one discusses the concepts of change and architecture by building a theoretical frame work in order to conclude the research problem, which appears in the ambiguity of knowledge about the theoretical and applicable relation between the designed and produced architecture in reality and what is produced after its change in time. It also discusses the aspects this change has, and the role of the "potentiality" in its taking place in both sides, the object, physical architectural product (a building) and the recipient subject. يتقصي البحث مفهوم العمارة والتغير ضمن إطار علاقتهما ببعض من جهة وعلاقتهما من خلال الموضوع (المبنى) مع الذات المدركة (المتلقي) من جهة اخرى، وذلك لبيان اثز الادراك المعرفي للمتلقي في تغيير ألنتاج المعماري، مع ايضاح فعل التغير المستمر الذي يقع على المبنى وما يترتب عليه من آثار وملامح تظهر في الشكل والمعنى، والتي تحدد لاحقاً نوع التغير الحاصل خلال فترات الثبات النسبي من عمر المبنى، الذي يعتمد بدوره على العامل الزمني اساساً في حصوله. يتعرض البحث الى التغير الذي يحدث في ابنية العمارة من خلال عملية تحول فهم ألمعنى والوظيفة التي تم تصميم المبنى لهما الى فهم المتلقي لاستعمال جديد، وعندما تصبح امكانات هذا المبنى من خلال عناصره مهياة لقبول الوضع الجديد، تمثل هنا "حالة الحضور" الفيزياوي امام المتلقي، بينما تمثل الغاية الجديدة "حالة الغياب" او "إمكان الغائب" وذلك لانها تعتمد على ادراك المتلقي في احضارها الى عالم الواقع. يناقش البحث مفاهيم التغير والعمارة بشكل عام، ويبني لهما اطاراً نظريا ثم يبحث مفهوم التغير وعلاقته بجوانب تغير الموضوع، ثم يبحث مفهوم العمارة من خلك مناقشة المفارقة التي تحدث بين قصدية التصميم المتضمنة فيها كصفة اساسية وما يتغير منها في الواقع عبر الزمن. بعدها يتقصى البحث علاقة المفهومين معاً من خلال ظاهرة "تغير العمارة" بشكل خاص لمناقشة ظاهرة عدم وضوح المعرفة حول طبيعة العلاقة الفكرية والتطبيقية التي تتوسط بين الابنية المعمارية المصممة وما يتنج من تغيرها ضمن فترة زمنية من حياتها في الواقع، فضلاً عن عدم وضوح الدور الذي يؤديه المتلقي في حصولها. ثم يتم بعدها ايضاح الدور الذي تؤديه قوى الامكان وفقاً لرؤية البحث في تغير العمارة، ولكل من طرفي التفاعل: الذات المدركة (المتلقي) – من خلال ادراكه المعرفي والموضوع (المبنى) من خلال عناصره. One of the Quality of Service (QoS) routing problems is link-constrained, path constrained routing, and example of such problem is delay and bandwidth-constrained routing. Here, the proposed solution is presented through our proposal routing algorithms DCUR-AB (Delay Constraint Unicast Routing at Available Bandwidth) and ADCUR-AB (Adaptive Delay Constraint Unicast Routing at Available Bandwidth). DCUR-AB and ADCUR-AB routing algorithms are proposed to solve the most popular QoS problem (Delay-constrained routing problem). Our proposed algorithms solve this problem in addition to take into account one of the important network resource (bandwidth). From experimental results for DCUR-AB it is found that this algorithm has a limitation searching to find the optimal path with taking into account the bandwidth constrained, therefore; it is proposed here another routing algorithm called ADCUR-AB that has a wide search to find the optimal path, then a practical comparison between the two proposed algorithms results is applied and it is found that the second algorithm is better than the first one. أحدى مشاكل تحديد المسار في نوعية الخدمة (QoS) هي مشكلة تحديد الاتصال-تحديد المسار ومثال على هكذا مشاكل هي مشكلة تحديد التأخير Delay Constrainedتحديد الحزمة Bandwidth Constrained. هنا تم أقتراح خوارزميتين لحل هذه المشكلة وهما خوارزمية تحديد المسار الاحادي مع تحديد التأخير بوجود الحزمة DCUR-AB وخوارزمية تحديد المسار الاحادي مع تحديد التأخير بوجود الحزمة المطورة ADCUR-AB. هاتان الخوا رزميتان اقترحتا لحل مشكلة عامة ومنتشرة في نوعية الخدمة وهي مشكلة تحديد التأخير للمسار وقد تم الأخذ بنظر الاعتبار تحديد الحزمة التي تعتبر من الموارد المهمة في الشبكة. من النتائج المختبرية لخوارزمية DCUR-AB وجد أن لها حدود بسيطة في عملية البحث لايجاد المسار الافضل عند الأخذ بنظر الاعتبار تحديد الحزمة لذلك تم أقتراح الخوارزمية الأخرى ADCUR-AB التي تملك مجال بحث واسع لايجاد المعمار الافضل. ثم بعد ذلك تم عمل مقارنة عملية فوجد أنه الخوارزمية الثانية هي الافضل بالأداء من الأولى. Routing Algorithms --- QoS Routing --- QoS constraints --- link-constrained and path constrained routing problem. Five formulations of fuel-rich propellant consisting hydroxy-terminated poly-butadiene (HTPB) based polymer, ammonium perchlorate (AP) and magnesium (Mg) or aluminum (Al) as additive have been processed and investigated. Theoretical calculations of flame temperature and gas composition were determined by NASA-273 computer code. The sustained ignition / combustion of such propellant is possible with long duration pyrotechnic igniters. The experimental investigations of the effect of solid particle size range and content on fuel ballistic and mechanical properties have revealed that a considerable enhancement may be obtained with fine particle size and high content percent. High air-to-fuel ratio increases the combustion efficiency in the ramjet-mode resulting in higher specific impulse. يتناول هذا البحث تصنيع و دراسة الخصائص المقذافية و الميكانيكية لخمسة انواع من الوقود الفني المخصص لتطبيقات النفث التضاغطي. أنجزت الدراسات النظرية لهذه الأنواع الخمسة من الوقود باستخدام البرنامج المعروف (273 – NASA). لقد وجد إن سرعة الاستجابة للمشاعل و استمرارية الاحتراق تعتمد على زمن تأثير المشعل البايروتكنيكي. الدراسات العملية لتأثير الحجم الحبيبي لمساحيق المواد الصلبة المضافة أثبتت انه كلما كان الحجم الحبيبي قليل و كانت نسبة المواد الصلبة عالية نحصل على مواصفات مقذافية وميكانيكية أعلى. أما التجارب العملية باستخدام نسبة هواء إلى وقود عالية نسبيا فقد أظهرت زيادة في كفاءة الاحتراق و بالتالي الحصول على دفع نوعي أعلى. Fuel-rich propellant --- ramjet solid fuel. This paper studies the non-linear behaviour of a clayey Iraqi soil taken from Baghdad City, using the bounding surface plasticity model under static and dynamic loading. The bounding surface plasticity model needs a group of input parameters. Some of them are determined directly from triaxial and consolidation tests, while the others are evaluated from a parametric study using a computer program named EVAL.A series of advanced laboratory tests was performed after modifying and manufacturing some parts of the triaxial machine that are required for carrying out Ks-consolidated compression and extension tests. The soil test results are used in a computer program named EVAL to compute the soil properties and input parameters for the Iraqi clayey soil under consideration that are required in the bounding surface plasticity model. After the input parameters became available, one could use them in finite element computer programs for static and dynamic analyses. Two-finite element programs are chosen. The first program, named ACED used for solving coupled problems under static loading. While the second program, named DLEARN, is used for solving dynamic problem. The proposed abbreviation of Baghdad silty clay soil is (BBSC).. The program EVAL gives the input parameters for the Iraqi clayey soil that the bounding surface plasticity model needs. The values obtained of these parameters are as follows: Lamda=0.064, Kappa=0.017, Mc=1.20 , Me/Mc=0.676 , Poissons ratio=0.4 ,Rc=2.70 , Re/Rc=0.85 ,Ac=0.05 , Ae/Ac=0.8يقدم هذا البحث دراسة التصرف اللا خطي للتربة العراقية المأخوذة من مدينة بغداد عند تعرضها للأحمال الساكنة والحركية باستخدام نموذج اسطح المحيط اللدن. يحتاج هذا النموذج الى عدد من المدخلات .بعض هذه المدخلات يحسب بصريقة مباشرة من فحص الأنضغاط وفحص الاستطالة الثلثثي المحاور.اما المدخلات الأخرى فيتم احتسابها بمساعدة برنامج حاسبة EVAL وبالمقارنة مع نتائج الفحوص المختبرية الى ان يتم الوصول الى اعلى درجة من التقارب بين نتائج البرنامج ونتائج الفحوص المختبرية. تم عمل دراسة لكل البحوث المنجزة التي تتطرق الى تصرف التربة اللاخطي باستخدام نموذج السطح المحيط اللدن وقد تبين من فك ذلك انه ليمر هنالك دراسة لتصرف التربة العراقية اللثخطي باستخدام النموذج المذكور وذلك لعدم توفر المدخلات والخواص التي يحتاجها هذا النموذج ولعدم توفر الفحوص المختبرية المتكاملة العالية الدقة عن التربة العراقية التي يمكن بواسطتها الحصول على المدخلات التي يحتاجها نموذج السطح المحيط اللدن، فقد أصبح الآن حاجة وضرورة لتوفير مثل هذه الفحوص واستخدام الخواص والمدخلات التي يحتاجها النموذج ثم الاستفادة منها في تحليل تصرف التربة اللاخطي تحت الأحمال الساكنة والحركية على تربة بغداد. أجريت مجموعة من الفحوص المختبرية المتقدمة على هذه التربة بعد إجراء بعض التحويرات على جهاز فحص الانضغاط الثلاثي المحاور وتصنيع عدد من الأجزاء اللازمة لإنجاز فحص الاستطالة وفحص الانضغاط على نماذج منضمة على خط K0. وتم الاستفادة من نتائج الفحوص المختبرية في برنامج الحاسبة EVAL لاحتساب خواص التربة العراقية التي يحتاجها السطح المحيط اللدن ومقارنتها مع النتائج المختبرية وباستخدام أسلوب المحاولة والخطأ حتى الوصول إلى تطابق جيد بين نتائج البرنامج ونتائج الفحوص المختبرية. وبعد توفر الخواص والمدخلات الخاصة بالتربة العراقية التي يمكن أستخدامها لنموذج السطح المحيط اللدن، أصبح من الممكن استخدام هذه المدخلات في أي برنامج حاسبة يتضحن عمله نموذج السطح المحيط اللدن لحل كافة المسائل التي تصف تصرف التربة في حالة تعرضها للأحمال الساكنة أو الأحمال الحركية. وتم أختبار برنامج حاسبة يسمى ACED وهو برنامج حاسبة يعمل بطريقة العناصر المحددة لحل مسألة التربة تحت الأحمال الساكنة وقد تم أختبار مسألة الانضمام بأتجاه واحد . أما مسائل الاحمال الحركية فقد تم أختبار برنامج DLEARN وهو برنامج حاسبة يعمل بطريقة العناصر المحددة ويستعمل هذا البرنامج لحل مسائل الأحمال الحركية وقد تم أختيار مسألة باتجاه واحد عند تعرضها لاحمال الدالة الجيبية . وقد تم الحصول على مجموعة من الاستنتاجات من خلال إجراء هذا البحث أهمها أن تربة بغداد هي تربة طينية غرينية بنية اللون مفرطة الانضمام. كما تم الحصول ولأول مرة على المدخلات التي تصف التصرف اللاخطي لتربة بغداد باستخدام نموذج السطح المحيط اللدن والمبينة قيمها في الجدول الاتي: Lamda=0.064, Kappa=0.017, Mc=1.20 , Me/Mc=0.676 , Poissons ratio=0.4 ,Rc=2.70 , Re/Rc=0.85 ,Ac=0.05 , Ae/Ac=0.8 كذلك فقد تم وصف تصرف التربة تحت أحمال حركية وساكنة فى تطبيقات مختلفة.وتبين من حكر تلك التطبيقات كفاءة نموذج السطح المحيط اللدن في وصف تصرف التربة عند تعرضها الى أحمال ساكنة وأخرى حركية كذلك اتضح من خلال التطبيقات دقة المدخلات التي تم الحصول عليها وهذا يثبت دقة النتائج المختبرية. Shell foundations are generally found to be economic under conditions of heavy loads and weak soils as small amount of reinforcement is needed due to occurrence of compressive stresses in most parts of the foundation. Depending upon their size, conical shells can serve as footings for columns while inverted domes shells can serve as rafts for tanks supported on a circular row of columns. This paper describes 3-D finite element models, the eight nodes degenerated shell and the twenty nodes brick elements which are used herein. The models which may be adopted in the material nonlinear analysis of reinforced concrete shell foundations are described briefly in this paper. The present study results give good agreement compared with available experimental values about 5% in displacements.تكون الأسس القشرية المصنوعة من الخرسانة المسلحة بصورة عامة اقتصادية في حالة الأحمال الثقيلة المستندة علن تربة ضعيفة لأكتفاء هذه الأسس على حديد تسليح قليل بسبب حصول اجهادات ضغط في معظم اجزاءها. اعتمادا على أحجام الأسس فان القشريات المخروطية يمكن استخدامها كأساس لعمود بينما القباب المقلوبة يمكن استخدامها كأساس لخزان مستند على سطر دائري من الأعمدة. ان هذا البحث يتناول طريقة لتحليل الأسس القشرية الخرسا نية المسلحة باستخدام طريقة العناصر المحددة في الأبعاد الثلاثية حيث تم استخدام العنصر القشري المنحل ذو العقد الثماني لتمثيل الاساس والعنصر الطابوقي ذو العقد العشرون لتمثيل التربة وقد تضمن التمثيل التصرف أللا خطي للقشريات الخرسانية المسلحة المستخدمة كأسس. أظهرت نتائج هذه الطريقة كفاءة ودقة بالمقارنة مع النتائج العملية بحدود 5% فرق في الازاحات. Finite elements --- material nonlinearity --- shell --- foundations. Modern manufacturing enterprises are increasingly faced with fierce international competition and fluctuating market conditions. To gain flexibility from a functional manufacturing system and efficiency from mass production, group technology has emerged as an effective compromise between the two. Identification and grouping of parts, that share similar processes into cells, is the basic problem in the design of cellular manufacturing systems. The design of cellular manufacturing systems is a complex, multi - criteria and multi – step process which can have significant implication for the entire organization. The formation of machine cell and part families have a number of constraints such as number of cells, cell size, technological requirements, and any other constraints like cost and time. This research proposes an expert system called CAEGT, which controls a number of constraints during the formation of machine cells and part families by using three methods. The system was tested in a manufacturing company and it gives an efficient results. تواجه الشركات والمؤسسات الصناعية الحديثة المنافسة الصناعية والتجارية العالمية ومتطلبات السوق المتغيرة. فالصناعات اليوم تواجه مشكلة تقليل كلف الانتاج والتصنيع وتأدية طلبات المسهلك في تجديد المنتجات، تقليل الكلف، وتحسين النوعية. ومن اجل الحصول على المرونة الأنتاجية المرتبطة عادة بأنظمة التصنيع الوظيفي بالأضافة الى رفع الكفاءة الأنتاجية المرتبطة عادة بأنظمة الانتاج الكميه فقد توجه النظر الى استخدام تقنية المجاميع التكنولوجية كوسيلة فعالة بين الاثنين. وتعتبر عملية تكوين عوائل الأجزاء، التي تكون متشابهة في الخواص أو العمليات، وخلايا المكائن الخاصة بهذه العوائل هي المشكلة الأساسية في تصميم أنظمة التصنيع الخلوي. عملية تصميم انظمة التصنيع الخلوي هي عملية معقدة، ذات معايير ومراحل متعددة والتي لها تأثير هام على المؤسسة الصناعية. أن مرحلة تكوين خلايا المكائن وعوائل الأجزاء ذات محددات كثيرة مثل عدد ألخلايا، حجم الخلية، المتطلبات التكنولوجية وغيرها من المحددات مثل الكلفة والوقت. البحث الحالي يقدم نظام خبير سمي (CAGET)، والذي بواسطته يمكن السيطرة على عدد من المحددات الداخلة في عملية تكوين خلايا المكائن وعوائل الأجزاء بأستخدام ثلاثة طرق مختلفة. النظام المقترح أُختبر قي شركة انتاجية وكانت النتائج المستحصلة ذات كفاءة جيدة. Group Technology --- Cellular Manufacturing --- Cell Formation --- Expert System. The investigation-included experiments were conducted to investigate the local and average mixed convection heat transfer coefficient for thermally developing and fully developed hydrodynamically laminar airflow in an inclined annulus. The experimental setup, using an aluminum annulus having a radius ratio of (0.41) and the inner tube with a heated length of (0.85m) with constant wall heat flux boundary conditions. The investigation covered Reynolds number range from (332 to 1128) and heat flux varied from (82w/m2 to 545w/m2). The air is developed hydrodynamically by using the entrance section annulus (calming section) having the same inner and outer diameter as a test section but with variable lengths. The entrance sections included a long calming section with a length of 90 cm (L/Dh =20.93) and short calming section with lengths of 60 cm (L/Dh =13.95). The results obtained represent the temperature distribution along the inner tube surface, the local and average Nusselt number distributions with the dimensionless axial distance (Z+). For all annulus orientations and all entrance sections, the results show an increase in the Nusselt number values as the heat flux increases and as the angle of the inclination moves from the vertical to the horizontal position. A comparison was made between the experimental results and the available previous work of Mataira, D. and Subba Raju, K. (1975), for the local Nusselt number distribution with the dimensionless axial distance (Z+). The results obtained showed a good agreement and has the same trend that obtained in the previous work. يتضمن هذا البحث إجراء تجارب عملية لبحث معامل انتقال الحرارة الموقعي والمعدل بواسطة الحمل المختلط لجريان المواء الطباقي المتطور حرارياً وتام التطور هيدروداينميكياً في أنبوب حلقي مائل. يتكون الجهاز العملي من أنبوب حلقي مائل نسبة القطر له (0.41) و أنبوب داخلي مسخن و بطول (m0.85) تحت الشرط الحدي بثبوت الفيض الحراري. يتراوح رقم رينولدز في هذا البحث من 332 إلى 1128، وكذلك يتغير الفيض الحراري من (82w/m2 إلى 545w/m2). يكون الهواء تام التطور باستعمال أنابيب مدخل حلقية (أنابيب تهدئة) لها نفس قطر الأنبوب الداخلي والخارجى لجزء الاختبار ولكن بأطوال مختلفة. تتضمن أنابيب المدخل أنبوب طويل بطول (20cm) (L/Dh=20.93) وكذلك أنبوب مدخل قصير بطول (60cm) (L/Dh=13.95). النتائج المستخرجة وضحت توزيع درجة الحرارة على سطح الأنبوب الداخلي، وكذلك تون يع رقم نسلت الموقعي والمعدل مع المسافة المحورية اللابعدية (Z+). لكل زوايا ميل الأنبوب الحلقي و لكل أنبوبي المدخل المستخدمين، بينت النتائج إن قيم رقم نسلت تزداد كلما ازداد الفيض الحراري وكذلك يزداد رقم نسلت كلما زاوية ميل الأنبوب الحلقي تتغير من الموقع العمودي إلى الموقع الأفقي. أجريت مقارنة بين الدراسة العملية والعمل السابق للأدبيات المتوفرة لعمل Mataira, D. and Subba Raju, K. (1975)، لتوزيع رقم نسلت الموقعي مع المسافة المحورية اللابعدية (Z+) حيث أظهرت النتائج موافقة جيدة وتم الحصول على نفس الشكل الذي حصل عليه الباحث. Experimental mixed convection --- heat transfer --- thermally developing air flow --- inclined annulus. Different parameters were investigated to evaluate their effect on the process removal efficiency of COD and color, by using different H2O concentration, UV power, multi-step addition of H2O2, and air bubbling. As a result, the color can be removed completely within 20 minutes, and the COD removal of approximately 90% can be achieved within 40 minutes of UV illumination. This process favors the H202 addition in one step rather than in four steps. Supply of oxygen does not enhance the process removal efficiency. The overall result indicates that the operating cost (chemical and electricity) to reduce the COD to below 80 mg/l is 0.93 US$/m3. يهدف البحث الى دراسة ومعرفة المعوامل !لمؤثرة على كفاءة ازالة الـ (COD) واللون من المياه الصناعية لمعامل النسيج. تم !ستخدام تراكيز مختلفة في بيروكسيد الهيدروجين وكذلك دراسة تأثير قدرة الاشعة الفوق البنفسجية المستخدمة ودراسة تأثير استخدام الفقاعات الهوائية على كفاءة الاكسدة وازالة اللون. تم الحصول على نتائج جيدة في ازالة اللون حيث تمت ازالة اللون بصورة تامة في مدة (20) دقيقة وتحقيق نسبة ازالة للـ (COD) بمقدار % 90 في حدود (40) دقيقة من التعرض للـ UV . كذلك وجد أن استخدام الهواء لا يعزز كفاءة الازالة وان كلفة عملية الازالة وتقليل الـ COD الى اقل من 80 mg/lit هو 0.93 $/m3 . COD --- oxidation --- photoreactor. In this paper the hardware implementations is investing of 8x8 Discrete Cosine Transform (DCT) and Inverse Discrete Cosine Transform (IDCT) on different Field Programmable Gate Array (FPGA) technologies using the modified Loeffler algorithm. The investigations involved simulations, and synthesis of Very High Speed Integrated Circuit Hardware Description Language (VHDL) code utilizing recent FPGA families of Xilinx, Altera, and Lucent. The paper achieving the most demanding real-time requirements of some standardized frame resolutions and rates. Synthesis results for 8-point DCT/IDCT implementations indicate operating frequencies of 50 MHz, 60 MHz, and 22 MHz for the investigated Xilinx, Altera and Lucent FPGA chips, respectively. These frequencies allow 2193 Source Input Format (SIF) and 100 High Definition Television (HDTV) frames to be processed by the Xilinx FPGA. The resulting frame processing rates for Lucent are 877 and 40 for SIF and HDTV, while for Altera they are 647 and 29, respectively. Results indicate that the investigated FPGA implementations would speed DCT based compression algorithms up to frame rates well above the real-time requirements of SIF, International Consulting Committee on Radio & Television (CCIR-TV) and HDTV frame formats. في هذه المنشورة تم الاستقصاء عن البناء المادي لـ 8x8 تحويلة الجيب تمام المتقطعة (DCT) ومعكوسة تحويلة ألجيب تمام ألمتقطعة (DCT) في عدة تقنيات لترتيب بوابة برمجة المجال( (FPGAباستخدام خوارزمية Loeffler المحورة. الاستقصاء يتضمن التشبيه والتركيب لشفرة لغة وصف الكيان المادي ذات السرعة العالية جدا (VHDL) المستخدمة في ألآونة الاخيرة عن طريق عوائل ترتيب بوابة برمجة المجال (FPGA) من شركةLucent & Xilinx Altera . إن اغلب متطلبات الزمن الحقيقي (real-time) لبعض تصاميم الهياكل ومعدلاتها القياسي تم تحقيقها. نتائج ألتركيب لبناء 8 نقط تحويلة جتا المتقطعة (DCT) او معكوسها تبين انه ترددات العمل هي 50 ميغاهرتز و 22 ميغاهرتز، 60 ميغاهرتز و22 ميغاهرتز لقطع Lucent & , Altera , Xilinx ترتيب وابة المجال على التوالي. النتائج تبين انه استخدام الـ FPGA لبناء DCT & IDCT يسرع منه وكذلك الاقتراب يكون أكثر من تحقيق متطلبات الزمن الحقيقي لصيغة أدخال المصدر (SIF)، الجمعية الاستشارية الدولية للراديو والتلفزيون (CCIR-TV) والتلفزيون العالي التعريف (HDTV) من صيغ الهياكل. Discrete Cosine Transform (DCT) --- VHDL --- FPGA --- Reconfigurable Processor. Iraqi paraffin wax (1.0 wt% aromatic content and 4.4 wt% oil content, Basrah origin) was hydrotreated over commercial Pt-Re/y-Al2O3 catalyst in order to study aromatic removal reaction (de-aromatization) kinetics. Reaction temperature varied from 453 to 533 K over a liquid hourly space velocity from 0.5 to 4.2 h-1. Hydrogen pressure was kept constant throughout all the experiments at 3.6 Mpa with hydrogen to wax ratio about 400 m3/m3. Kinetics analysis showed that the hydro-de-aromatization reaction followed a second order kinetics model. Energy, enthalpy and entropy of activation of hydro-de-aromatization reaction were 17.2 kJJ/mole, 13.1 kJ/mole and -16.9 J/mole K, respectively. تم هدرجة شمع برافينى عراقي المنشأ (ناتج من عملية تكرير نفط البصرة) ذو محتوى زيتي 4.4 % وزناً و 0.1 % وزناً مواد اروماتية بأستعمال عامل مساعد Pt-Re/y-Al2O3 وذلك لدراسة حركية تفاعل ازالة المواد الاروماتية. تراوحت درجة حرارة التفاعل بين 453 و 533 كلفن و سرعة سائل فراغية بين 0.5 و 4.2 ساعة-1. ثبت ضغط الهيدروجين المستعمل و لكل التجارب بمقدار 3.6 ميكا باسكال و نسبة هيدروجين الى شمع 400 م3/م3. اشارت النتائج الى ان موديل حركية التفاعل هي من الدرجة الثانية و كانت مقدار طاقة التنشيط للتفاعل 17.2 كيلو جول مول و انثاليبية التنشيط 13.1 كيلو جول / مول و انتروبية التنشيط - 16.9 جول / مول كلفن. Hydro-de-aromatization --- kinetics model --- paraffin wax --- activation energy. Corrosion of carbon steel pipe in aerated O.l N NaCl solution under isothermal turbulent flow conditions (Reynolds number= 15000-113000 and temperature of 30-60°C) is investigated by weight loss method. The effect of Reynolds number and temperature on corrosion rates is experimentally studied and discussed. Corrosion mechanism is analyzed as a mass transfer operation and the corrosion rate is expressed in terms of mass transfer dimensionless groups (Sh and St) and in terms of usual corrosion units. The results of corrosion rates are compared with many proposed models particularly those based on the concept of analogy among mass, heat, and momentum transport by determining experimental friction factor. The capability of these models to express corrosion rates over the investigated range of Re and temperature is examined and discussed. Many of these correlations are adopted to estimate corrosion rates for the considered system. It is found that Reynolds number increases the corrosion rate depending on temperature. Temperature increases the corrosion rate for high and moderate values of Reynolds number. At low Reynolds number the effect of temperature depends on oxygen solubility, oxygen molecular diffusivity, and Reynolds number (or eddy diffusion). Generally, Von Karman and Prandtl- Taylor analogies (based on the experimental friction factor) show good agreement with experimental mass transfer results while Chilton-Colburn analogy exhibits reasonable agreement at low Reynolds number and some overestimation at high Reynolds number. تم إجراء إختبارات التآكل على إنبوب من الفولاذ الكا ربوني في محلول كلوريد الصوديوم (0.1 عياري) الحاوي على أوكسجين الجو الذائب تحت ظروف الجريان المضطرب بسرع ودرجات حرارة مختلفة (عدد رينولد 15000 الى 113000 ودرجة حرارة من 30oC إلى 65oC) بإستخدام طريقة فقدان الوزن. تمت دراسة مختبرية ومناقشة تأثير عدد رينولد (أو السرعة) ودرجة الحرارة على معدل التآكل وتأثير. تم تحليل عملية التآكل كعملية إنتقال كتلة ووضعت علاقات تجريبية وضعية لحساب معدل التآكل تحت ظروف مختلفة. وقد تم مقارنة النتائج العمليه مع عدة علاقات موضوعة للتعبير عن انتقال الكتله بين الجدار والمائع وخاصة العلاقات المبنية عن التشابه في ميكانيكية الانتقال بين الكتلة والحرارة والزخم لمعرفة امكانية حساب معدل التآكل باستخدام هذه العلاقات. وقد تم اعتماد بعض هذه ألعلاقات للتعبير عن معدل التآكل للنظام المذكور. دلت النتائج على ان زيادة عدد رينولد تؤدي الى زيادة معدل التآكل لكل درجات الحرارة وكذلك تاثير عدد رينولد على معدل التأكل يتغير بتغير درجة الحرارة والزمن. زيادة درجة الحرارة تؤدي الى نى يادة معدل التأكك لقيم عدد رينولد المتوسطة والعالية أما عند قيم عدد رينولد الواطئة فان تاثير درجة الحرارة على معدل التآكل يعتمد على قيمة عدد رينولد. أبدت علاقات (Prandtl-Taylor) و (Von Karman) توافقاً جيدا مع النتائج العملية لكل قيم عدد رينولد. كذلك أبدت علاقة (Chilto1-Colburn) توافقا مع النتائج العملية عند قيم عدد رينولد المنخفضة وأعطت نتائج عالية نسبيا عند قيم عدد رينولد العالية. This work implements the face recognition system based on two stages, the first stage is feature extraction stage and the second stage is the classification stage. The feature extraction stage consists of Self-Organizing Maps in a hierarchical format in conjunction with Gabor Filters and local image sampling. The next stage is the classification stage, and consists of self-organizing map neural network; the goal of this stage is to find the similar image to the input image. The proposal method algorithm implemented by using C++ packages, this work is successful classifier for a face database consist of 20 people with six images for each person. يستخدم هذا البحث في تمميز الأوجه مرحلتين، الأولى أستخراج مواصفات هذه الأجسام والثانية تصنيف هذه الأوجه. تتم مرحلة أستخراج المواصفات بأستخدام الشبكات العصبية نوع (Self Organizing Map) في بناء هرمي مع فلتر من نوع (Gabor). الخطوة التالية هو أستخدام الشبكات العصبية والفلتر نوع (Gabor) في تمييز الأوجه وذلك بأستخدام لغة البرمجة ++C ونماذج صور لعشرين شخص مع ستة صور لكل شخص. Gabor filter --- SOM (Self Organizing Map). The most efficient nozzle is generally considered to be that for which the discharge coefficient is nearly unity. Nozzle dimensions influence the discharge coefficient. In sprinkler irrigation systems there are many types of nozzles because any sprinkler irrigation system has special one depend on these system characteristics, so the discharge coefficient relation with nozzle dimensions must be known to the sprinkler irrigation system designer. 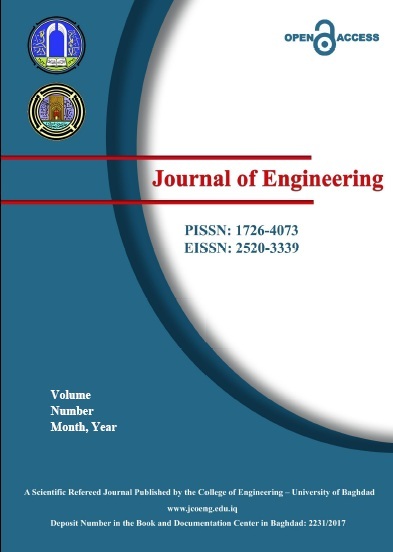 A computer program for nozzle flow characteristic was built and the relation between the discharge coefficient (Cd) and the nozzle geometrical dimensions to reach to the best nozzle design was studied. The finite difference approach was introduced to carryout all computations with special grid arrangement. The steady state Navier-Stocks equations complemented with (k - ε) turbulence models were solved. These work calculations were for nozzle of convergent part with some angle (3.7° -7.7°) followed by straight part (tip part). Three values were taken for the convergent part length; three for tip part length and the nozzle diameter changed for three values also. The Reynolds number range was 1.95 x 10^5 < Re < 3.9 x 10^5 and Fortran 95 computer program language was used. The results gave good imaging to the relation between nozzle dimensions and the discharge coefficient, where the major result was increasing the tip length is allowing the boundary layer to growth and hence increasing its thickness and so discharge coefficient decreasing. Comparison of the results with ANSYS package shows that the present numerical method was accurate enough and might be used to predict the discharge coefficient for the sprinkler irrigation system nozzle. النفاث الأحسن كفاءة يعتبر عمومأ الذي له معامل تدفق الأقرب إلى الوحدة الواحدة. معامل التدفق يتأثي بأبعاد النفاث، في منظومات الري بالرش يوجد أنواع متعددة من النفاثات ذلك لان كل منظومة ري بالرش لها نفاث خاص بها يعتمد على مواصفات هذه المنظومة، لذلك علاقة معامل التدفق بأبعاد النفاث يجب أن تكون معروفة لمصمم منظومات الري بالرش. تم بناء برنامج حاسوبي لإيجاد خواص جريان النفاث وتم دراسة العلاقة بين معامل التدفق وأبعاد النفاث الهندسية للوصول إلى احسن تصميم للنفاث. استخدمت طريقة الفروق المحددة لانجاز الحسابات مع شبكة عقدية خاصة، معادلات Navier-Stock للحالة المستقرة بالتكامل مع نموذج(k - ε) للإضطراب تم حلها. الحسابات في هذا العمل تمت لنفاث ذو جزء متقارب بزاوية معين (3.7° -7.7°) يتبعه جزء ثابت المساحة العرضية، تم أخذ ثلاثة قيم لطول الجزء المتقارب وثلاثة لطول الجزء الثابت و ثلاثة لقطر النفاث أيضاً. مدى قيم رقم رينولد كان 1.95 x 10^5 < Re < 3.9 x 10^5 و تم استخدام لغة الحاسبة فورتران.95 النتائج تعطي تصور جيد للعلاقة بين أبعاد النفاث و معامل التدفق حيث النتيجة الرئيسية كانت أن زيادة طول الجزء الثابت المساحة تسمح للطبقة المتاخمة أن تنمو وبالتالي زيادة سمكها وهذا يؤدي إلى نقصان معامل التدفق. مقارنة النتائج مع تنائب برنامج ANSYS أظهرت أن الطريقة المستخدمة ذات دقة كافية وممكن استخد امها لإيجاد معامل التدفق لنفاثات منظومات الري بالرش. Finite difference --- two-dimensional --- incompressible fluid --- turbulent flow --- sprinkler irrigation nozzle --- discharge coefficient. This study was conducted to estimate the suction head at the wetting front τw in the Green and Ampt infiltration equation using uniformly packed soil columns of three different - textured soils. Four different approaches were used for this estimation. Cumulative depths of infiltration I along with the visual wet front advance Z was recorded with time t. Soil water content profiles were also obtained by which the sharpness of the wet front was tested using an empirical model adopted from van Genuchten (1980) model for soil moisture-suction head relation. The Green and Ampt equation did fit the infiltration data very well with significant correlation of its parameter K1 with the physical measure of saturated hydraulic conductivity Ks. Four different methods were used to estimate τw: from fitting the Green and Ampt equation to infiltration data (I vs. t), numerical integration using hydraulic conductivity as a function of suction head K(τ) in the basic definition equation of defining τw, numerical integration using conductivity as a function of volumetric water content K(θ), and from the soil sorptivity S evaluated from early time infiltration data using Philip one-term equation alons with Green and Ampt equation for horizontal infiltration. No significant differences were found between these four methods in estimating τw at 0.01 level. Significant differences, however, were found at the same level between the values of τw for the three soils as it was expected. نفذت هذه الدراسة لاختبار طرق مختلفة لتقدير الشد عند جبهة الابتلال τw في معادلة Green and Ampt لغيض الماء. قيس الغيض في اعمدة تربة متجانسة واستعملت ثلاث ترب ذات نسجات مختلفة. اثناء حركة الماء قس كل من عمق ماء الغيض المتراكم I ومسافة تقدم جبهة الابتلال Z مع الزمن t. استخرجت كذلك مقدات محتوى رطوبة التربة ومنها تم تحديد حادية جبهة الابتلال باستخدام نموذج محور عن معادلة van Genuchten (1980). طابقت معادلة Green and Ampt بيانات الغيض بشكل متميز، واظهرت النتائج وجود علاقة تطابق بين أحد معاييرها K1 مع الايصالية المائية المشبعة Ks المقاسة مختبريأ. قدرت قيم الشد باتباع اربع طرائق لقياس الشد عند جبهة الابتلال. كان أولها من مطابقة معادلة Green and Ampt مع بيانات الغيض التراكمي.. ومز اجراء التكامل العددي وباستعمال الايصالية المائية غيرالمشبعة كدالة للشد K(τ) في المعادلة الاساسية لتعريف الشد عند جبهة الابتلال. ومن اجراء التكامل العددي باستعمال الايصالية المائية كدالة للمحتوى الرطوبي الحجمي K(θ). ومن قيم الامتصاصية المستخرجة من معادلة Philip ذات الحد الواحد لبيانات الغيض خلال الازمان المبكرة مع معادلة Green and Ampt للغيض الافقي. اظهرت الدراسة عدم وجود فروقات معنوية بين قيم الشد عند جبهة الابتلال المستخرجة بالطرق الاربع المختلفة عند مستوى 0.01 . ولكن توجد فروقات معنوية عند نفس المستوى لقيمها للترب المختلفة وكما هو متوقع. Green and Ampt --- hydraulic conductivity --- infiltration --- moisture profiles --- sorptivity --- suction head. A new correlation to calculate the solid stresses at the contact face between the pipe and the mud cake, for the case of differential pipe sticking (DPS), is developed. The proposed correlation takes into consideration the effect of setting (contact) time, thickness of mud cake, and viscosity of mud filtrate on the behavior of the solid stresses. A good match is obtained between the present correlation, the measured values, and Terzaghi trend for calculating the resulted solid stresses. This in turn leads to estimate the minimum force required to free the stuck pipe. تم تطوير علاقة تجريبية جديدة لحساب الاجهادات الصلبة عند منطقة التماس بين كيك الطين وأنبوب الحفر لحالة الأنابيب المستعصية تفاضليأ. هذه العلاقة المقترحة تأخذ بنظر الاعتبار تأثير زمن التماس (الاستقرار)، سمك كيك الطين، ولزوجة راشح ألطين على سلوك الاجهادات الصلبة . كما تم المحصول على تطابق جيد بين العلاقة الحالية وقيم الإجهاد المقاس وقيم طريقة Terzaghi لحساب الاجهادات الصلبة الناتجة. إن هذا بدوره يقود إلى تقدير القوة اللازمة لتحرير أنبوب الحفر الذي تعرض للإستعصاء. Differential pipe sticking --- wall stacking --- solid stresses --- sticking force --- pulling force.